"In 1895, orange and cream cats were placed together in one class. 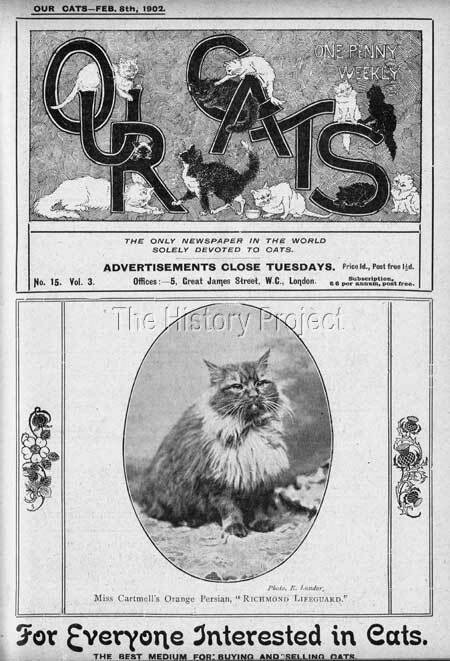 A specialist society for orange, cream, fawn and tortoiseshell cats was founded in 1900, and although the number of members is small, yet have they proved a strong body of staunch supporters of these breeds, and a really astonishing amount of good work has been done by these few enthusiasts. The classification at the large shows has been greatly supplemented, and, whereas before the formation of the society the sexes were never separated, now this energetic little club asks for, obtains, and often guarantees extra classes. The result, therefore, to breeders of orange and cream cats is much more satisfactory, the males and females have their respective classes; and right well have they been filled. "Colour and marking: - Colour to be as bright as possible, and either self or markings to be as distinct as can be got.25. Coat: To be silky, very long, and fluffy. 25. Size and Shape: - To be large, not coarse, but massive, with plenty of bone and substance; short legs. 20. Head: - To be round and broad, with short nose, ears small and well opened. 15. Eyes: - To be large and full, and bright orange or hazel. 5. Condition: - 10." "I incline towards a self-coloured orange in the Persian breeds, and a very handsome cat this would be - of just one tone of bright even colour, perhaps slightly lighter on the flanks and stomach, under the tail, and with a frill of paler tone....."
"Of course, it is possible that in time orang cats maybe bred to such perfection that two distinct classes will be given, namely 'orange' (selfs) and 'orange tabby'. 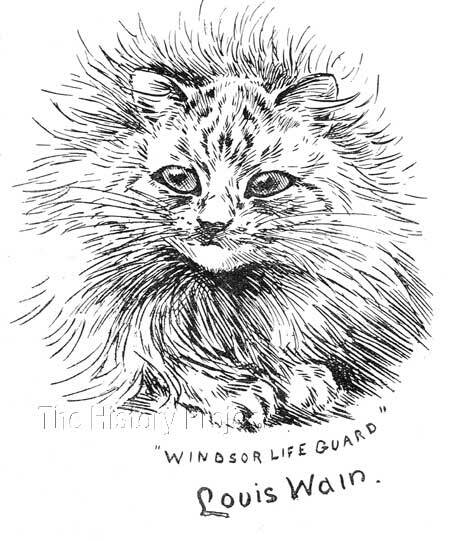 Also, from The Book of The Cat (1903), when Miss Frances Simpson was reviewing some of England's most notable catteries, and that especially of 'Bishopsgate', owned by Lady Marcus Beresford; she made specific mention of some of its former celebrated inmates, among them, 'Lifeguard', whom she described as "a grand orange of massive build". This cat was almost unmarked, of a beautiful bright shade, and had an unusually round head and short face, with long silky coat." Hallmark 'red' Persians in England during this early period of the fancy, included cats such as 'Lifeguard', 'Puck', 'Benjamin of The Durhams', 'Fulmer Prince of Orange' ,'Torrington Rufus', 'Torrington Sunnysides', 'Golden Butterfly' and 'Orange Girl', while in the United States the march of the 'red' began with imports such as 'Napoleon the Great', 'Ravenswood Hamish' and 'Red Knight', followed by some of their respective sons, 'Bunch', 'Kephren' and 'Dandelion', as well as 'Prince of Orange' and 'Red Prince of Gladdisfenn'. 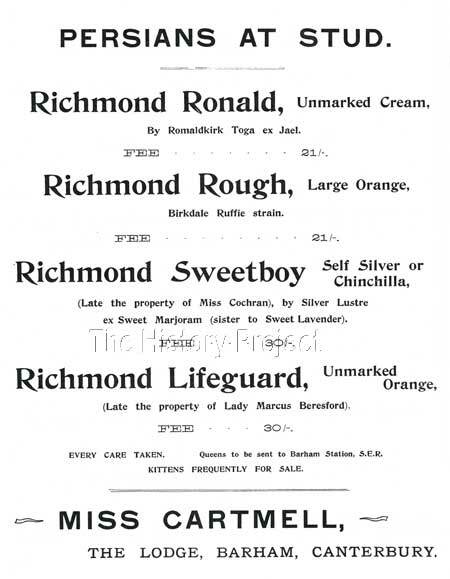 'Lifeguard' was born in March, 1895, bred by Mrs. A. Spackman of Great Bedford St, Bath, by her orange male 'Puff' and out of 'Topsey' (aka Topsy). Although we have no indication of the colour or heritage of 'Topsey', she also appears to have been the dam of 'Lifeguard's' sire 'Puff'(born 21st March,1890), who is listed in The Cat Club Register (CCR) as sired by Mrs. Frost's 'Yankee' , and bred by Mrs. Spackman, out of Mrs. Spackman's 'Topsey'. So, the breeding which produced 'Lifeguard' was, in fact, that of a mother to son. As to exactly when 'Lifeguard' became the property of Lady Marcus Beresford is unclear, but it is likely to have been when quite young. His was listed as her property in The Cat Club Register, Vols. 1 & II for 1898 and 1899, although it seems likely from the information available that he changed hands again, shortly after that, probably in the first quarter of 1899. 'The Stud Quarters' of Lady Marcus Beresford's cattery at Bishopsgate. The home of 'Lifeguard' between 1896 and 1899. 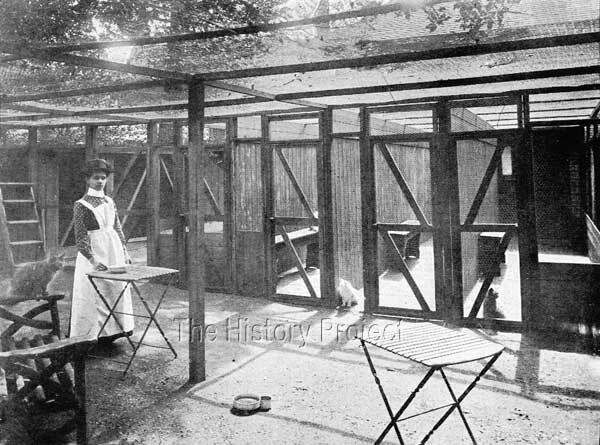 Note the long and spacious runs, segregated fully by solid walls and the fully covered exercise yard where the attendant is waiting on a female Persian cat. The only full sibling to 'Lifeguard' appears to be an orange female named 'Goldy Locks of Heale', an older sister, born 13th February, 1894. (NCC:1780). She was bred of course by Mrs. Spackman of Bath, and owned and shown by Mrs. H.M. Marriott. 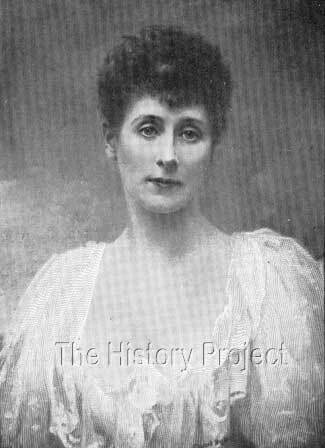 She is credited with a 3rd prize, at the Crystal Palace in 1894. 1st and 3 Specials - Windsor,1895; Two 1sts - Holland Park, 1896, 1st, Crystal Palace, 1896; 2nd, Westminster, 1899. 'BLUE PRINCE', a Blue Persian neutered male, born 25th July, 1897, owned by Miss Grace Shaw. 'RICHMOND AL ROY', an Orange Persian male, born 25th July, 1897, owned by Mrs. Cartmell. 'TOMMY DODD', a Red & White Bi-Color Shorthair neutered male, born in 1897, owned by Mrs. A. Kindall. 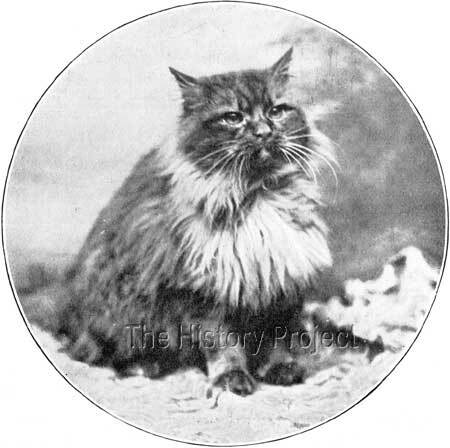 'PUSSINKAT', a Tortoisehell Shorthair female , born in 1897, owned by Miss R.Mortivals. 'ROBERT ORANGE', an Orange Persian male, born 28th January, 1901. Owned by Mrs. G.E. Charles. 'TOM TIDDLER' a Brown Tabby Persian Male, born 28th January, 1901. Owned by Mrs. G.E. Charles. 'WYNNSTAY GUINEA GOLD' an Orange Persian male, born 28th January, 1901. Owned by Mrs. F.W. Western. (later owned by Miss M. Bellamy). The most interesting point to note from the above list is Mrs. Stennard Robinson's decision to breed her Tortie Shorthair female to a Red Longhair. Whether it was usual to breed longhaired cats to shorthairs in order to produce more shorthairs and to register them with impunity is not clearly known, but the register speaks for itself. This is all the more interesting when you realise that Mrs. Stennard Robinson was the very capable Secretary of the National Cat Club at the time, as well as popular Secretary of The Ladies Kennel Association. In Volume II of The Cat Fanciers' Association Stud-book, we also find an imported grandson of 'Lifeguard' registered as 'RED ADMIRAL'. His dam is a female dam 'Cinders', a daughter of 'Lifeguard' out of an unnamed Blue-cream. Fanciers of 'Orange' or 'Red' cats are usually conscientious devotees to their color. And although they will also be admirers of other colors and/or patterns, for them, the red retains a special place in the heart and they are very often passionate about preserving it. Whether this is because they love the warm hot tones, or as is the case with the tabbies, the depth of color and contrast of a rich mahogany red upon a warm but lighter red ground, or for some other factor, each will have a reason they can relate to explain their relentless passion for this truly beautiful hue. For a few it may be a genetic factor, like the noticeable predisposition for depth of eye color, or it will be something more intrinsic, such as their personalities, intelligence or their affectionate natures, or, even on occasion, their diffidence! Regardless of the reason, the lovers of Reds are loyal to their cause and very often specialists in their variety. Today, Reds the world over are among the very typiest of Persians, being counted amongst the most celebrated Persians of all time.They often sport the deepest and most intense eye color. This is certainly not a new trait, and finding a red with intensely copper or even mahogany eye color is now very much the norm. But it is easy to forget, that this development has taken over 130 years. Reds continue to have the 'wow' factor when presented in a full flowing coat, and it is important that we never lose sight of the wonderful work done within this variety, by the exceptionally passionate breeders who have 'lighted the pathway' making it possible for us to enjoy what we, in this day and age, so very often take for granted.